"If you speak three languages you're trilingual. If you speak one you're English". It sounds clichéd, but unfortunately the statistics bear this out. About 10% of UK workers speak a second language, while in other EU countries 56% speak two languages and 28% speak three. Many Britons just don't see the point of other languages, when most of the world seems to speak English. Yet throughout Europe and many other parts of the world, multilingualism is seen as highly desirable, worth striving for and attainable for most people. In many countries monolinguals are the exception rather than the norm. So who's got it right? If it's the multilinguals, then how can we learn from them? There are lifelong cognitive benefits to knowing two languages and transitional benefits gained during the learning process. Studies show that at every level, bilinguals perform better in cognitive tests. Children who study a second language do better at logical reasoning, mathematics and English verbal tests. They get better exam results and adults who are competent in more than one language do best in both verbal and nonverbal intelligence tests. 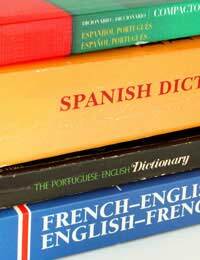 In old age bilingual people have less cognitive decline than monolinguals. Early exposure to a second language actually causes more connections to grow in the child's brain and these connections in turn allow for easier learning in both languages. Creativity, flexibility and lateral thinking ability are fostered by exposure to two languages, as well as improved capacity of the brain to multi-task. Old people wary of dementia are encouraged to keep their minds active by learning another language. The mental challenge should strengthen brain connections and keep them sharp. Quite apart from all this there are obvious social and employment advantages to having access to two cultures. In countries like Holland, Switzerland and Luxembourg, language learning begins in primary schools and it is common for families to be multilingual. Language learning is viewed as the norm rather than as something difficult or only for gifted children. The earlier you start learning another language the greater the chances of success and the easier the learning process. Brain imaging suggests that as well as having greater phonetic (sound based) sensitivity, the actual neural pathways children use to learn a second language are different to those that adults use. By age 15 a child's facial muscles and bones are nearly mature and his musculature loses sensitivity to phonetic distinctions that are not relevant to the language he speaks. Adult students can rarely attain perfect foreign accents, while children absorb native inflections naturally. UK language teachers bemoan the fact that after 5 years of secondary school French, most pupils can't speak, read or write the language except in short "phrase-book" sentences. Yet it's possible, especially for young children, to learn a language in 6 months. Apparently, there's something sadly lacking in our whole approach to language teaching and learning. Recent government reports seem to have taken this on board to some degree and there is a trend towards encouraging more language learning in primary schools. Most experts agree that exposure is the key. Whatever your age, you'll learn fastest in an atmosphere where everyone speaks the language you're trying to learn. Even if you're already an adult, it's never too late. The best way is to spend lots of time in the country where they speak the language you want to learn. If you can't do that, then you have to work on your own exposure through CDs, DVDs and finding native speakers to talk to. You should try to talk as much as possible, without getting embarrassed over mistakes and concentrate on getting across the message, using roundabout ways if you don't know all the words. Some people just seem to have a knack for languages. Recent studies have shown a brain based correlation. French volunteers were taught to distinguish the French "d" and the Hindi "da" sound. The faster learners were found by MRI to have more white matter in the sound processing parts of the brain than the slow learners. Do Our Languages Determine How We Think? Chinese researchers got volunteers to solve maths puzzles while lying in a MRI brain scanner. Remarkably, their results showed that Chinese speakers used the visual and spatial part of the brain, while English speakers used different brain regions involved in the meaning of words for solving the same problems. In Russian, light blue and dark blue are two different words. In a study comparing colour perception, Russian speakers were faster than English speakers at distinguishing shades of blue. As anyone who's ever argued with a foreign lover would know, it seems that the language we speak affects how we see the world! So the more languages that we have available, the wider our perspective and opportunities.